Last month, we posted about unwanted ad injectors, a common side-effect of installing unwanted software. Ad injectors are often annoying, but in some cases, they can jeopardize users’ security as well. Today, we want to shed more light on how ad injector software can hijack even encrypted SSL browser communications. 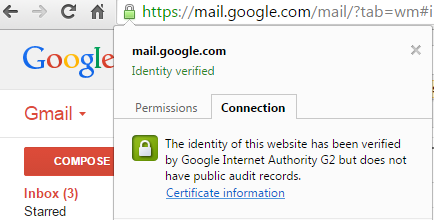 In the example below, the ad injector software tampers with the security trust store that your browser uses to establish a secure connection with your Gmail. This can give the injector access to your personal data and make your computer vulnerable to a 'man in the middle' attack. SSL hijacking is completely invisible to users because hijacked browser sessions appear like any other secure browser session. The screenshot on the left shows a normal connection to Gmail, the one on the right shows the difference when a SSL hijacker is installed. You may recall the recent SuperFish/Komodia incident. As has been reported, the Komodia SSL hijacker did not properly verify secure connections and it was not using keys in a secure way. This type of software puts users at additional risk by making it possible for remote attackers to impersonate web sites and expose users’ private data. Safe Browsing protects users from several classes of unwanted software that expose users to such risk. However, it never hurts to remain cautious when downloading software or browsing the web. When you are visiting a secure site, like your email or online banking site, pay extra attention to any unusual changes to the site’s content. If you notice unusual changes, like extra ads, coupons, or surveys, this may be an indication that your computer is infected with this type of unwanted software. Please, also check out these tips to learn how you can stay safe on the web. For software developers, if your software makes changes to the content of web sites, the safest way to make those changes is through a browser extension. This keeps users’ communications secure by relying on the browser’s security guarantees. Software that attempts to change browser behavior or content by any other means may be flagged as unwanted software.